Internet surfing is increasingly becoming very amusing as well as challenging nowadays. There are several internet browsers available in the market both for PCs, laptops as well as mobile phones. The development of Internet browsers for tablets as well has created a revolution in this particular digital world we are now living in. UC browser is amongst those most basic mobile browsers available, still offers numerous choices for the users. The UC browser is available for nearly all operating systems in mobile devices like iOS, Java, Symbian and Android too. However, till now UC browser was not designed for personal computer OS such as Windows and Mac. But the good news is, UC web browser for PC is now available and has a user interface very much similar to that of the mobile version of the UC browser. The popularity of UC browser is increasing at a very fast rate. That is just because of exiting features offered by this web browser. First of all UC browser is available on the internet and is totally free. The next best thing about this Net browser is its speed. The browser is super fast and also loads almost all the websites very quick. Next, UC browser also compresses web pages considerably and hence lessening your data usage and thereby cutting down your regular data expenses. It also supports flash so we can play videos and there is no need to mention that the GUI offered by the browser is extremely simple to use. In addition to this the download manager provided by UC browser is really great. It is possible to pause and resume your downloads at any time you want. It also facilitates multiple tabs similar to any other advanced web browser. There are many other supplementary factors as well that explains why this web browser is loved among the users. There are generally 3 ways to download UC browser on pc. The very first one is easy that could be done within a few moments. The next two are a bit complex, although not too difficult. Here we assist you to get UC Browser working for your PC quickly. The first technique is actually straightforward. You just need to get the download file and then run it. It does not really need any type of installation or such stuff. As you will observe the download file is a ZIP file therefore you simply need to extract it and you will immediately get an exe file with a symbol of UC browser. You can then simply run that .exe file by double-clicking it. The second technique is a bit complex as compared to first one. This is because in the second technique, we are going to run a java file on PC which requires some other programs to be present on your computer. First of all you need to download JRE (JAVA) from the internet and then install it. This is a must condition. Your PC must have JAVA installed as we are going to run a java file on it. Then after installing JAVA you need to download and install an Emulator for running JAVA apps on Windows. Now you need to download UC browser for pc Java application. Run the JAVA emulator and then just locate and run UC Browser java application right away. UC Browser will start and run just like it used to run on any mobile phone. The third technique is similar to the second one. The only difference is that, here we are going to run android UC Browser application on windows instead of JAVA UC Browser application. 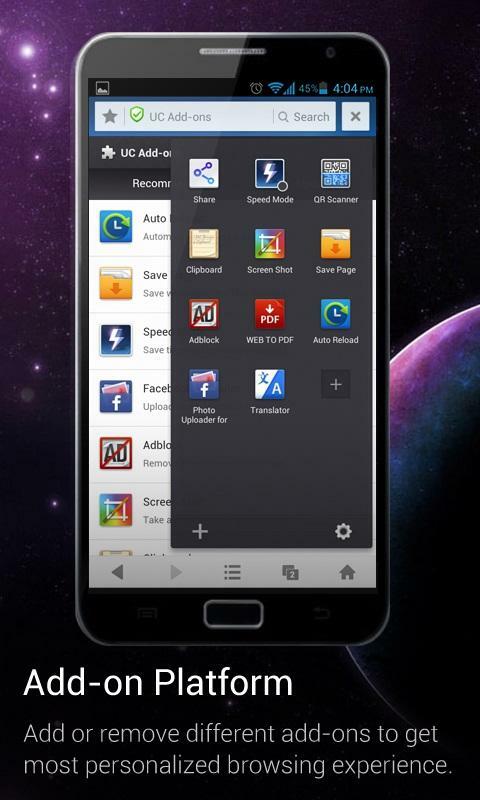 The Android UC Browser application is more advanced and has a better GUI than JAVA application. To install Android application of UC Browser you first of all need an Android Emulator known as Bluestacks. You need to download Bluestacks and install it on your computer. After installation run the installed software and search for “UC Browser”. The application will be installed in a short period of time and a shortcut icon will appear on your desktop. Now you just need to double click and start the UC browser and enjoy the wonderful experience of Web browsing. So there is nothing to wait for. UC browser for Computer is undoubtedly very popular and also very simple to operate. It loads internet pages within the blink of your eyes and also does not use up a lot of data. You must download UC browser for PC immediately and take advantage of its power on your pc as well.